I love to be adventurous in the kitchen, and one of my favorite things to make is frozen desserts. 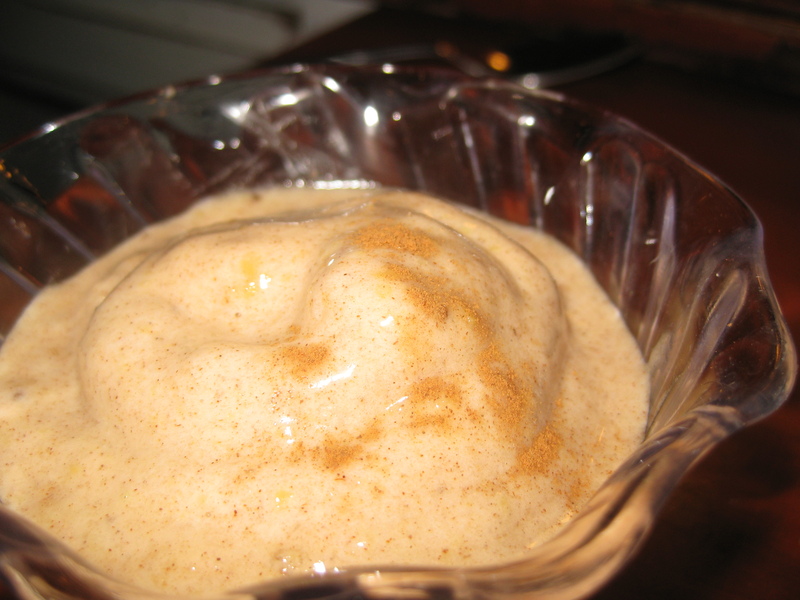 Even when it’s cold outside- banana “ice cream” is quite scrumptious. A handful of frozen bananas, some skim milk, a dash of cinnamon, and a few drips of vanilla. Simple and decadent. I’m also a big fan of my food processor. The thrifted Sunbeam Oskar has a sturdy little motor, and can create about 2.5 cups of hummus, various dips, and purees in a matter of seconds. 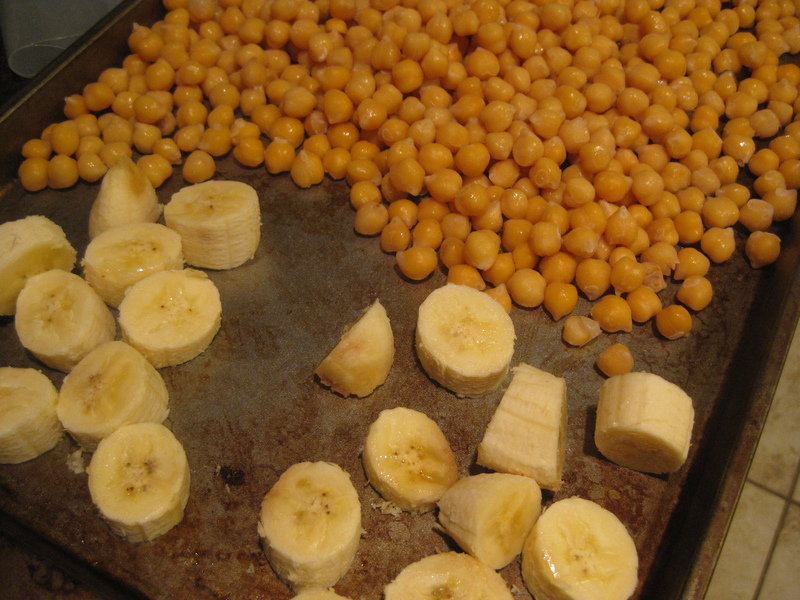 Hummus… bananas… hmmm…. What if, instead of “Vanilla Bean”, I made “Banana Bean”? To freeze bananas, peel them, and then cut into 1 inch chunks. Place on a metal cookie sheet with sides (a jelly roll pan works well) and place in the freezer for about a half day. Then place the frozen banana pieces in a plastic freezer bag. I have found that they will keep for about a month before they start to get brown. I actually froze chickpeas on the same sheet- I cook a whole big pot at once, drain, and then freeze them like this (once again transferring to a bag when they are frozen), so that I can pull out the exact amount I need. This isn’t a decadent ice cream, but it’s good. And it’s packed full of fruit and fiber at 6.5 grams- a pretty good chunk of the recommended 25 grams per day! 1/2 of recipe, calculated with no added sweetener. It’s important to note that this is calculated with a medium banana- so if the bananas you use are extra big or small, this will affect the nutrient content. It might have been a bit more accurate if I had weighed it. Speaking of frozen things, cross country skiing has been my preferred form of aerobic exercise these past few weeks. Fresh air, low cost, fun. If you’ve never tried it before, you totally should. Categories: Healthy Dishes, Wellness | Tags: bananas, beans, ice cream, xc skiing | Permalink. 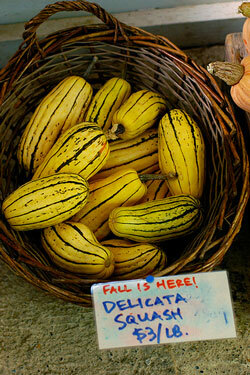 For $2 at the Morgantown Farmers’ Market on Sunday, I picked up a wee little gem: a Delicata Squash. They are typically about 5 or 6 inches long, and 2 or 3 inches in diameter, and make a perfect meal for two people. I first discovered the beauty of cooking with these fall vegetables last year, at which point I called them: “My New Favorite Convenience Food” on my previous blog. Chop the squash in half lengthwise, and scoop out the seeds. Place both halves cut side down in a container with a little bit of water. Then either microwave the squash for about 4 or five minutes, or bake for about 15 minutes. Then, turn the squash over so you have little “canoes”. Fill with items such as cooked beans, tomato chunks, cooked rice, cooked ground beef, sauteed onions, and whatever spices you please. This is a great way to use leftover chili, or pieces of chicken, or anything that’s in your fridge, really! Top with a sprinkle of reduced fat cheese. Return to the microwave for five minutes or until contents are thoroughly heated and cheese is melted. For those of you who like measurements and ingredients, here is what went into mine tonight. 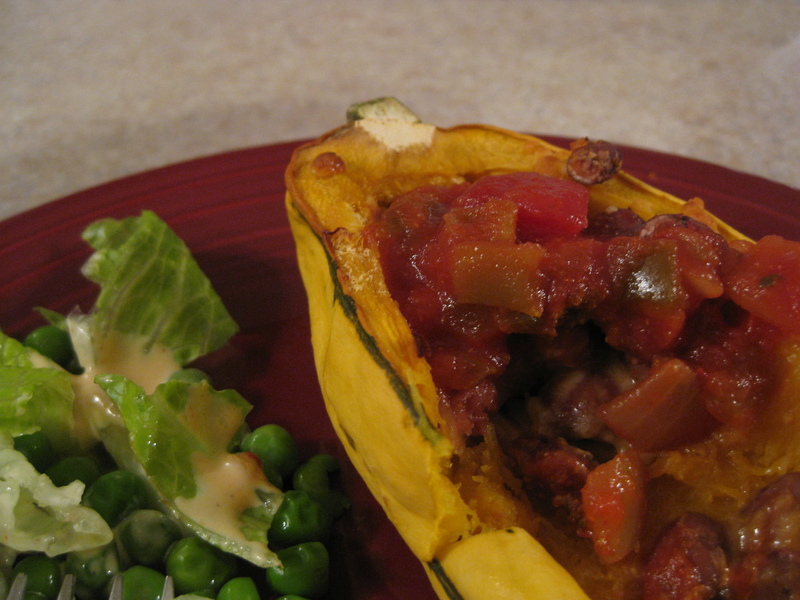 Place mixture in partially cooked squash, and return to oven or microwave to finish cooking. When you pull it out, top each half with 1/4 cup salsa. Winter squash is a more-than-excellent source of vitamin A, which is known to help promote and maintain healthy skin, teeth, connective tissues, and vision. So, rather than pay money to pop a pill, why not try some real food that’s super high in vitamins and minerals? Categories: Healthy Dishes, Local Foods | Tags: beans, cheese, farm market, food, nutrition, recipe, salsa, squash | Permalink. Last year, West Virginia’s Dining Services was awarded a gold level National Excellence in Worksite Wellness honor by the Well Council of West Virginia. WVU Dining Services provides healthy food options, offers stretching and walking breaks, and provides semi-annual employee training and other stress management programs. Another component of making this a Well Workplace is to provide monthly newsletters about pertinent topics for employee wellness. One of my projects at this rotation was to write an employee newsletter. I chose to focus on one of my favorite foods: beans! In addition, I also did some research and included information onstress management, physical activity, and smoking cessation. I’ve placed some exerpts from the newsletter here on the blog. If you want to see the finished publication, click to access the Wellness Program Newsletter. Beans and peas are excellent sources of plant protein, fiber, folate, and potassium, and provide other important nutrients, like iron and zinc. Cook a large pot of beans, drain, and then spread in a single layer on a cookie sheet. After a few hours, place the beans in a plastic freezer bag. Anytime you need beans for a recipe, just pull out a handful or two! Get other points of view. Talk with colleagues or friends. They may be able to provide insights or offer suggestions for coping. Just having someone to talk to can be a relief. Take a break. Make the most of workday breaks. Even 10 minutes of personal time can be refreshing. Have an outlet. All work and no play is a recipe for burnout. Make sure to spend time on activities you enjoy, such as reading, socializing or pursuing a hobby. Take care of yourself. Be vigilant about taking care of your health. Get regular exercise and plenty of sleep, and eat a healthy diet. Walk to your coworkers desk instead of sending an email. Walk, jog, skate or bicycle on the Rail Trail. Play tennis, racket ball, or volleyball. Which action steps are best for your needs? Leave the table immediately after I’m done eating. Brush my teeth or use gum or mints. Get busy with chores or a fun activity. Pay at pump rather than go inside. Try a new routine at break time, such as a crossword puzzle. Identify a reward for completing a project or task. Go for a walk with a co-worker during lunch. Categories: Wellness | Tags: beans, cholesterol, fiber, physical activity, protein, smoking, stress | Permalink.